Berkâs signature storytelling style invites students to actively learn beside the textâs âcharactersâ who share their influential experiences and developmental milestones. Students are provided with an exceptionally clear and coherent understanding of child development, emphasizing the interrelatedness of all domainsâphysical, cognitive, emotional, and socialâthroughout the text narrative and in special features. Focusing on education and social policy as critical pieces of the dynamic system in which the child develops, Berk pays meticulous attention to the most recent scholarship in the field. Berk helps students connect their learning to their personal and professional areas of interest and their future pursuits as parents, educators, heath care providers, counselors, social workers, and researchers. About: Berkâs signature storytelling style invites students to actively learn beside the textâs âcharactersâ who share their influential experiences and developmental milestones. About: Berk’s signature storytelling style invites students to actively learn beside the text’s “characters” who share their influential experiences and developmental milestones. About: With a heightened emphasis on the interplay between biology and environment, and stronger focus on education (both at home and at school) and social policy as critical pieces of the dynamic system in which the child develops, Berk pays meticulous attention to the most recent scholarship in the field. About: In this work, "Biology and Environment" boxes highlight the growing attention to biological influences in the field, addressing the interplay of biological and environmental forces. With Jenny L. Churchill | 2 edition from Prentice Hall (June 1, 1999); titled "Infants, Children and Adolescents"
About: As a best-selling, chronologically organized child development text, Berk Infants, Children, and Adolescents is relied upon in classrooms worldwide for its clear, engaging writing style and its commitment to examining the latest theory and research. 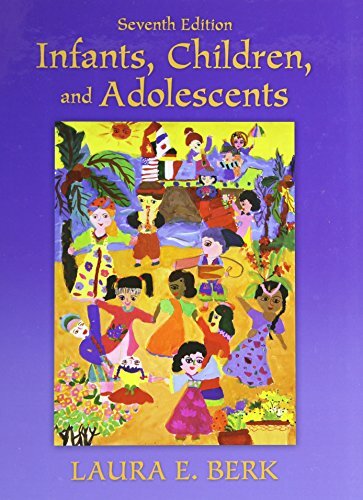 About: This is an updated edition of this text on child development, presenting a "cast of characters" based on real children and families for each unit. 7 pck unbn edition from Prentice Hall (July 19, 2011); titled "Infants, Children, and Adolescents: Books a La Carte Edition"
With Sherry Hansen Steiger, Brad Steiger | from Berkley Pub Group (June 1, 1992); titled "Starborn"
About: Theorizing that aliens are trying to make contact with humanity and that there are descendants of an alien race living on Earth, the authors present their unique theory on human contact with an alien intelligence.